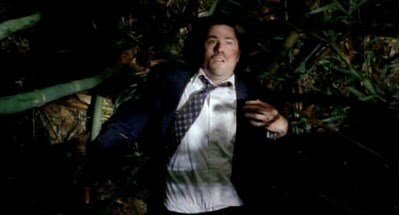 For my last three visits, though, I’ve dealt with this pain with a new mental strategy: I think about Lost. I come in with a specific mental task to perform about some unanswered aspect of the show–this time, the question of Jacob’s cabin, and how we saw the smoke monster on the island at all if he was really trapped inside by the ash, as seems likely–and then I think and think and think and ignore Captain Hook and his multifarious torture devices. I respectfully submit that watching Lost and being prepared to think about it at the dentist allowed me get a richer, more enjoyable experience out of that bamboo plant than the average patient. In other words, I had a transmedia moment, except that instead of a media narrative being conveyed through multiple distribution methods (TV, Internet games, tie-in books), it was conveyed and continued through my own life, my own mind, as one more step in the converging story of what Lost is and what it means to people. The question, then, is how far this goes. I wrote a personal essay on this a few months ago (which I can’t post here, as I’m trying to publish it), and the more I wrote, the scarier it became: the language of TV, movies, video games, and books creeps into my everyday experience in thick, regular ways–so much that it eventually becomes hard to find times when I’m not mixing my life with outside sources in some way or another. That sounds extreme, I know, but at times, it feels true. It’s the spirit of the remix, but in a cybrid, half-human and half-machine sort of way. And I don’t know what I think about that at all. Since I wrote about fans’ feelings of entitlement over the creative directions of the things they love, I’ve been wondering on and off about Lost–specifically, online reviewers’ claims about what ought to have happened/been revealed in any given episode. And as we get closer to the series finale (3.5 hours to go, at this point), it seems that this tendency to demand is growing fiercer. And finally, the reason this is actually worth writing at all: because as I said in my post back in February on “fans loving too much,” I usually A) have these gut-level reactions against Lost critics, and then B) feel kind of surprised at myself, since I intellectually support folks who take ownership of a series and do new stuff with it–say, in fan fic or vidding or art or whatever. Maybe it’s that creative fan activities feel like a different genre–or, in Lost language, a parallel timeline. Whenever someone says, “I wish they hadn’t shown ‘Across the Sea’ at all, and I’m going to write the episode that I would have put there instead,” the timeline splits and there’s beauty and coolness in both parallel worlds. But when someone says, “I want to pretend that I know as much as Darlton about what ought to have happened in the canon Lost universe,” well, I think that people should sometimes (but not always!) let Lost be Lost. I wrote a few days ago about the rhetoric of fiction, musing about what kinds of expectations fiction authors create in readers, and the weird reactions that result when readers’ expectations aren’t met. I’m thinking these days less about the rhetoric of fiction as a whole and more about examples of rhetorical appeals in fiction, as made by the characters. I think it would be fun to teach a course to English majors by using fiction (and TV shows and movies) to give examples of people persuading each other in all kinds of complex ways. I’m writing this post because I’ve never really approved of using literature to teach rhetorical writing skills. That’s because it’s fairly common for graduate students in literature at my university to teach first-year composition for their first few years, and it seems to me that they often try to turn it into a literature class, not an introduction to rhetoric class. Like, I would rather spend my precious little class time with students’ writing as the focus of the class, not in an open-ended, interpretive, lit-class-style conversation about whatever novel or short story we were assigned to read. I’m partly passionate about this because I’ve been convinced by rhet/comp scholars who feel similarly, and partly because I see this as the biggest failure of my two years teaching high school English: I thought chatting about books would make students better writers, but it usually didn’t. G. K. Chesterton’s The Man Who Was Thursday (full text and excellent free audiobook): I would have students read the first three chapters, which are full of arguments between individuals, arguments given in speeches to a group, and identity-switches (which are necessarily ethos-switches). I don’t want to be too spoiler-y, but this stuff is begging to be analyzed rhetorically–and if students read the whole book, it could even be read from a big-picture angle too, as we question the big-picture argument that Chesterton makes in the novel about the nature of God. “Hippocratic Oath,” a season-4 episode of Star Trek: Deep Space Nine, for very similar reasons: characters disagree with each other on really sticky ethical grounds, and they argue about it in all kinds of fascinating ways. And to DS9’s great credit, they refuse to cleanly resolve the issue. Love it. So, here are two bits of language from my main project site: the introduction text and the FAQ text. This site’s primary purpose is to house four surveys I’m conducting about the ways that fans creatively remix culture. I’ve picked four fan communities that I love (see main survey page to see which), chosen especially because I know that people there engage in some variety of fan remixing. Members of those communities are invited to respond to the surveys, and some will follow up the survey with an informal interview. You can read more about why I’m doing this on my FAQ page, but the basic idea is this: I’m a PhD student in rhetoric and composition at the University of South Florida, and I’m a fan. I want to learn more about the opinions of people who participate in fan communities that i admire, so I decided to ask them about what they do. I’ll benefit by presenting this work at academic conferences and perhaps by publishing the results–but I’ll also benefit personally through the enjoyment that comes from respectfully participating in the cool things that people are doing in fandoms that I admire. And hopefully, the fans I talk to will feel that they will benefit as well: by having a space to explain their remixing to themselves and to the outside world. To access the surveys, you can use the links in the left menu bar or head to the main survey page. What do you mean by “Remix Literacies”? But a number of people apply the word literacy to other contexts as well. If I show you a visual advertisement and you’re unable to “read” and understand the different strategies that the advertisers used to try to grab your attention, we could say that you’re lacking in “visual literacy.” If politics confuses you and you don’t really have any idea how it works, you’re lacking “political literacy.” You can’t read what’s going on. Remix literacy is a term that I and lots of other people made up (just try Googling it) to describe the ability to understand and create effective remixes. (Of course, “effective” varies depending on your setting, audience, and purpose.) People are creating amazing compositions all the time that grow out of found material; these people are extremely literate in the world of remixing one object into something new. I happen to think that fans are some of the best people at these remixing activities, since they are often so well versed in the worlds of their fandom. That’s why this project is called “Fan Culture” and remix literacies. And literacies is plural to emphasize that there’s no single kind of remix literacy–everyone does it differently, using different kinds of material and creating different kinds of compositions. And I think that’s cool. What do you mean by remix? Wouldn’t another word be better? Yeah, I see your point. People are right when they point out that the specific activities that make up remixing a song are different than those when, say, covering a song or altering it in other ways. But I wanted a single catch-all term that in some way encompasses the wide variety of activities that I’m surveying people about. What I’m really interested in could be called “composing from found material,” as long as you think of “composing” in a really wide sense and “found” as a metaphor for “existing in some way before you got to it to do your own thing.” But remix is shorter, catchier, etc. I’m Kyle Stedman, a PhD student in rhetoric composition, focusing especially on intellectual property, fan studies, digital rhetoric, and teaching writing. I’m findable on my blog, Twitter, Delicious, and Facebook, and I occasionally go by BasementWall (because I was staring at a basement wall trying to come up with a name). I’m a fan of (in order of most well-versed to least) Lost, Star Trek, Star Wars, the various Zelda games, and various video game soundtracks. Email is best: kstedman [at] mail [dot] usf [dot] edu. The idea of surveying and interviewing fan remixers was germinated by an inspiring article in the online academic journal Kairos by Jim Ridolfo and Dànielle Nicole DeVoss called “Composing for Recomposition: Rhetorical Velocity and Delivery.” Ridolfo and DeVoss describe the concept of a writer who knows that his or her work will be remixed in some way by someone else. Their example is a press release: the writer knows that journalists will take phrases and sentences from the press release and use them verbatim, mixed all around, added to and deleted from, in the eventual news story. I started to wonder how this applied to the creative work of fans, who “remix” ideas and images and sounds from their various fandoms all the time. What happens when fans create new work that they know other fans will take and remix again in a new way? What’s going on in these artists’ minds as they create? Why don’t scholars stay out of my business? I definitely recognize that scholars of fans have traditionally taken an us vs. them, anthropological role. (“Ooh, look over here and see what all the funny people are doing! How strange! I will now theorize about why they are so bizarre.”) But I also know that there’s a stellar tradition of scholars who are also fans stepping in to talk about themselves, represented most famously in Henry Jenkins‘ work, but also in the amazing collection Fan Fiction and Fan Communities in the Age of the Internet and in the work of the Organization for Transformative Works and its journal, Transformative Works and Cultures. Fandom is getting mainstreamed, and there is no way to avoid that mainstreaming. As fans, we prefer to control and possibly direct this mainstreaming, as well as the messages that circulate about us. Academic work on fandom can be part of the explication and contextualization of fandom. In fact, that’s why the journal was created. We think that fans can do a better job of writing academic works about fandom than nonfans can. So there’s a degree to which I could fall into the danger of becoming too academic and not fannish enough as I do this work. But at least I can say I’m aware of the dangers and am doing my best to keep my head above water.